It is sad, but we just don’t have resources to maintain these themes anymore. Themes for now work fine with current version of WordPress, but it may change, as developers make new things all the time, and like with latest WooCommerce 3.0 crashing update, sometimes it needs lot of our work to make theme compatible with these changes. That is why we changed way we make themes, and since FatMoon all our themes are kept up to date. No matter how popular they are on marketplace. If you check our FatMoon theme, or our new Rife theme, you can see that each one have many designs(demos), that you can easily import to get your site going. Since February 2018 we also offer Rife Free, that is totally free and powerful plus it has 5 very nice Designs that you can use. Be sure to check it out! With refreshed importer, you can now import just look of design to your site, without any demo content. 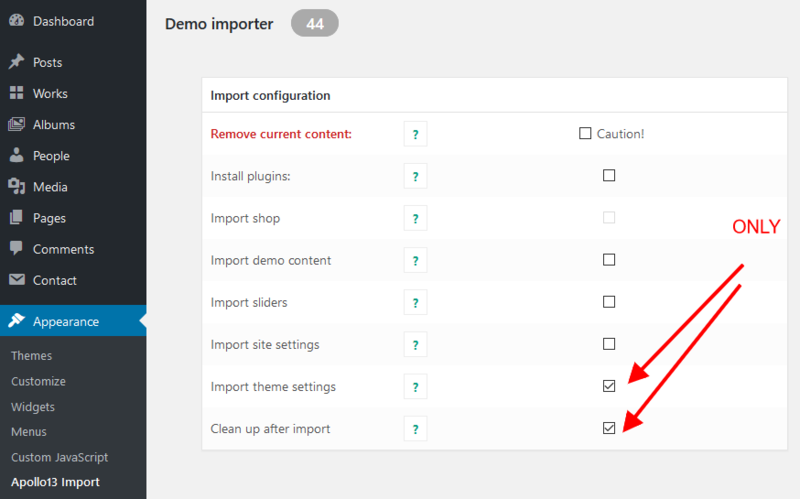 You just have to mark Import theme settings and optionally Clean up after import like on below screen shot, and your content will be safe. Anyway remember to first test moving to new theme on some test or staging server to protect your data from any mistake that can happen. Depending on theme you use now, not everything might be on place, so for example you may need to recreate your albums or works. For sure you will have to update theme settings that you have imported. You will have to update logo, maybe text in footer or some options that you don’t need. Often people get stuck with our option for header color variants(that give much power to header on sliders/rows, but can be confusing at beginning) and they can not change logo or different option of header. In this case refer to this section in documentation or check our tutorial about it. All designs for Rife theme. If you need more info you can always contact us here or on our support forum(if you are registered).